The organisers of the 2019 Island Games in Gibraltar say uncertainty surrounding Brexit is causing them anxiety ahead of this summer's event. MPs will vote on the UK's withdrawal agreement from the EU on Friday. More than 2,000 athletes are due to compete in the bi-annual event from 6 July, but there is uncertainty over Gibraltar's border with Spain. "There are lots of concerns," Linda Alvarez, chair of the Gibraltar 2019 organising committee told the BBC. "Nobody knows what's going to happen." Brexit: Will Spain's Gibraltar concerns crash on The Rock? The British territory stepped in to host the games in 2015 after Menorca pulled out of plans to host it. Guernsey has already made contingencies, with the island chartering an aeroplane which will make two trips to Gibraltar to ferry competitors, support staff and equipment to the event, rather than using the land border from Spain. "We're just really waiting for a decision to be made," said Guernsey Island Games chief Brian Allen. "It's the uncertainty that's the biggest problem. Do we need this? Do we need that? We just need a decision one way or the other. 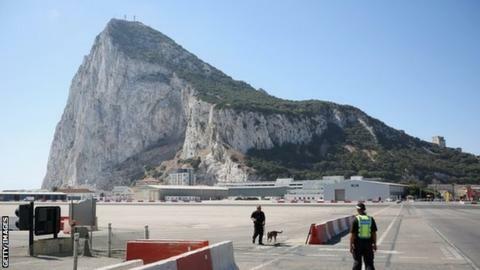 "The border between Spain and Gibraltar could cause us issues with families and so on that are trying to cross from Spain into Gibraltar being delayed," he told BBC Radio Guernsey. Read more on Brexit: Will Spain's Gibraltar concerns crash on The Rock?